Not MSI is the biggest supplier for gaming notebooks, but Asus. At least Asus now claims the title for themselves. 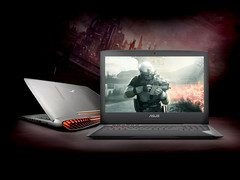 The advantage is particularly big for laptops with Nvidia GeForce GTX GPUs. Asus and MSI argue about the lead in the segment of gaming notebooks. Asus now claims the title as "number one" in a comparison of the worldwide market share for gaming notebooks, which is particularly interesting for mobile gamers. Maybe we should organize a battle to see who is really the number 1 in the segment of gaming laptops :). After MSI's report about the market leading position was based on a taiwanese government research institution, Asus now quotes the well-known GfK Group as source for the numbers. According to sales numbers of the GfK, Asus has a healthy market share of 40 % for notebooks with Nvidia GeForce GTX GPUs worldwide. This means Asus is the largest manufacturer of gaming notebooks in this segment. And this actually the second year in a row according to an enterprise message from Asus. The news states that Asus had the mentioned share of 40 % for global sales of gaming notebooks with GeForce GTX GPUs in the period between January and June 2016. The three unmentioned rivals for Asus were supposed to have a combined market share of 36 % in the same time frame. The biggest rival from Asus is supposed to have a share of just 13 %. This is probably MSI. The message also states that Asus managed market shares of 43 % in the Middle-East, Turkey and Africa (META) as well as 36 % in the economic region APAC (Asia-Pacific). Asus also mentions that the market analysts from Newzoo.com named the hardware manufacturer from Taiwan as the most popular PC gaming label amongst U.S. gamers. Among others, Newzoo uses data from the gaming platform for game widgets called Overwolf for its analysis.